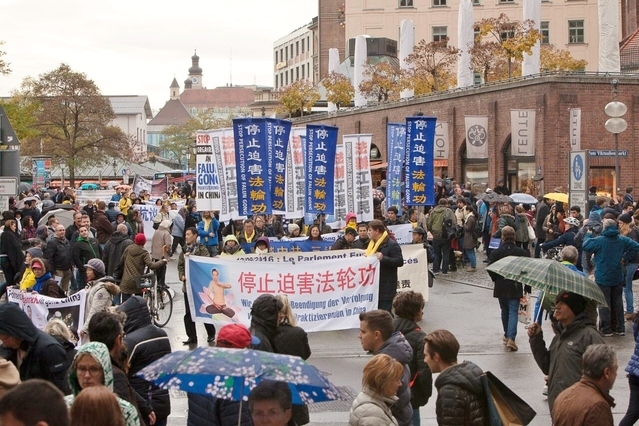 A large scale march by European Falun Gong practitioners in Munich on Saturday 5th November gained great support for the ongoing peaceful resistance against the 17-year persecution of this traditional spiritual discipline in China. 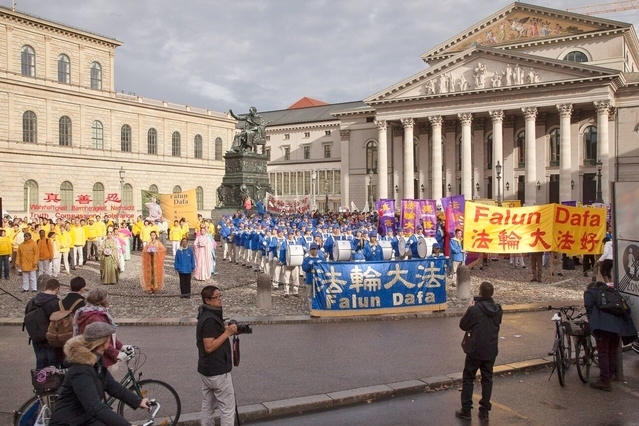 Stepping off from Odeonsplatz, Nearly one thousand Falun Gong practitioners followed the stirring sounds of the Tianguo Marching Band, passed by the Supreme Court, Karlsplatz, the train station, proceeded along Maximilian Avenue, finally terminating at Max-Joseph-Platz some three hours later. 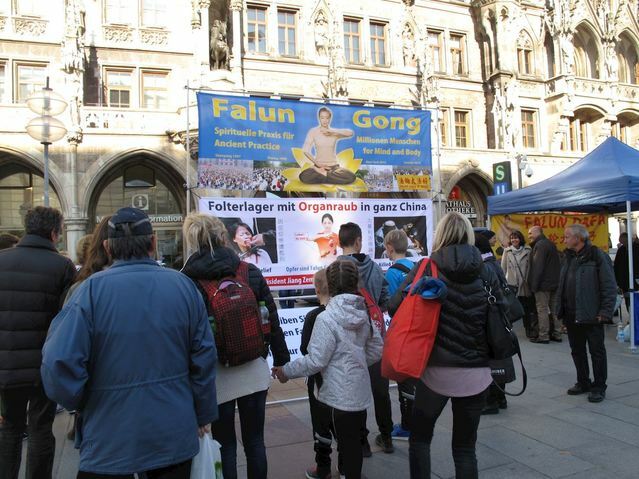 The march introduced Falun Gong, a peaceful practice based on Truthfulness-Compassion-Forbearance, and exposed the brutal persecution of Falun Gong in China. 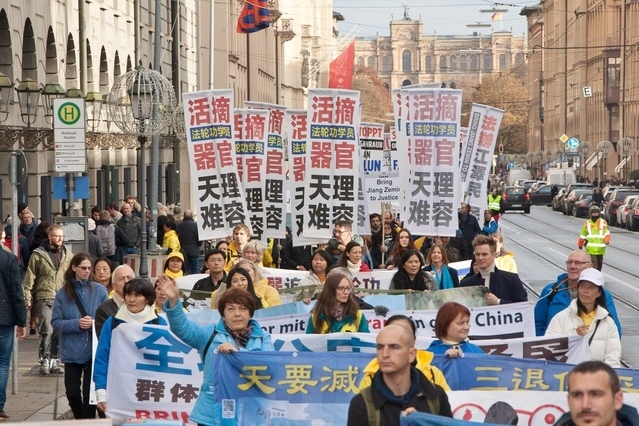 Practitioners called special attention to the Chinese Communist Party's forced organ harvesting of imprisoned Falun Gong practitioners and other prisoners of conscience. 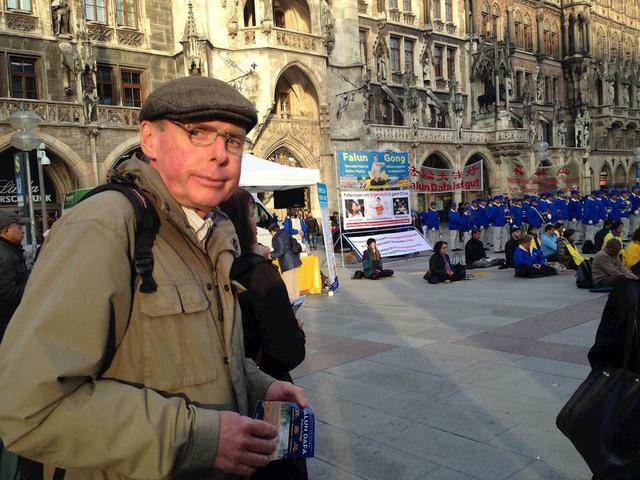 The call to end the persecution was readily echoed by people from all walks of life over the course of the march. Kindergarten teacher Michelle was excited to see the march. 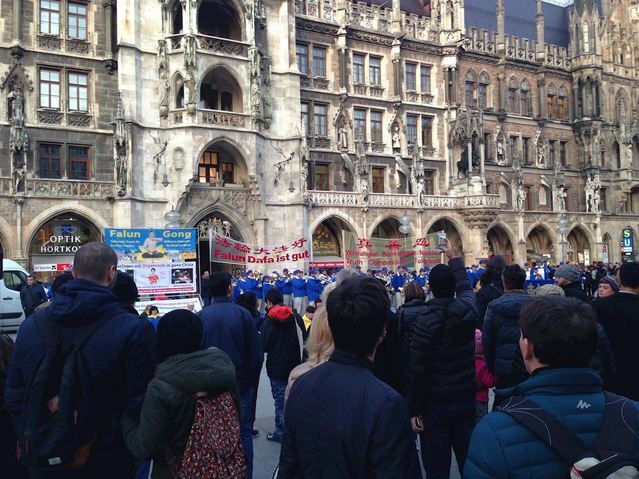 She witnessed a similar event in Vienna while visiting her son, where she learned about the forced organ harvesting. 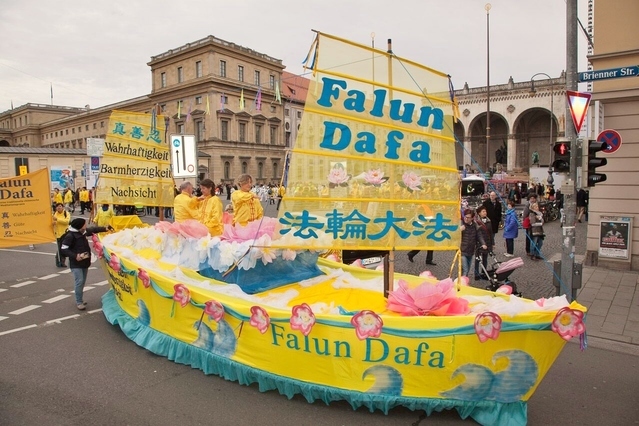 “The communist party looks strong, but Falun Gong's energy is finer and more persistent. So, the party will never win. You should keep bringing people the truth until the persecution ends,” Michelle encouraged practitioners. Lina, a Ph.D. candidate in zoology at a local university, accepted a flyer from a practitioner. 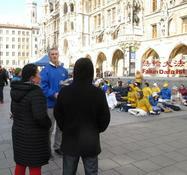 She'd never heard of Falun Gong before, but was concerned about the forced organ harvesting revealed in the flyer. 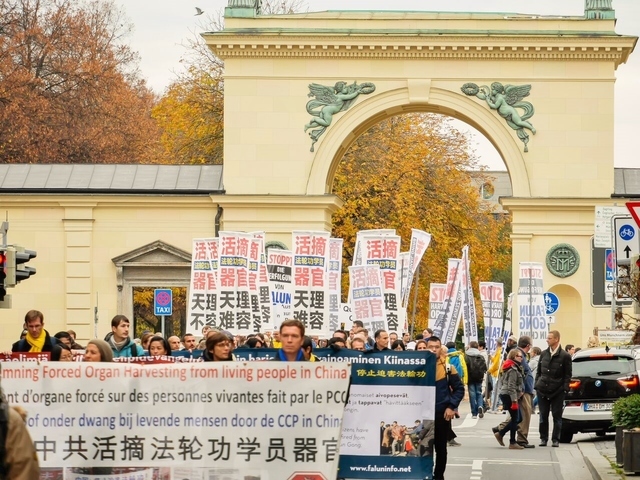 “During a trip to the U.S.A. 10 years ago, I heard about the organ trade in China. I was 14, and I was shocked,” she said. 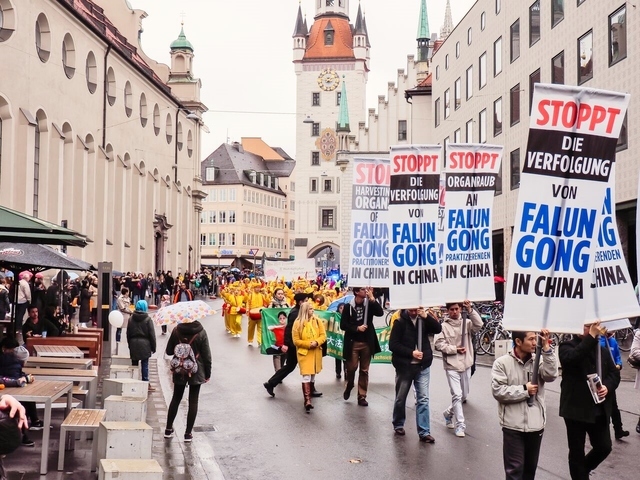 But she didn't know that it is the government that performs the forced organ harvesting in China, and behind this crime is the 17-year-long persecution of Falun Gong. 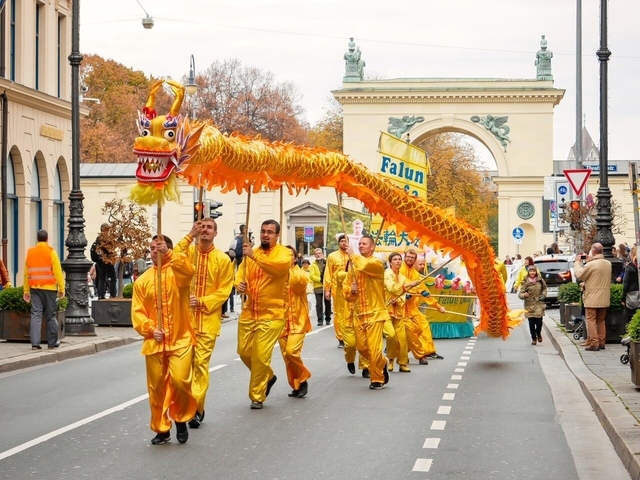 The march on Saturday was part of a series of Falun Gong events in Munich held over the past week. 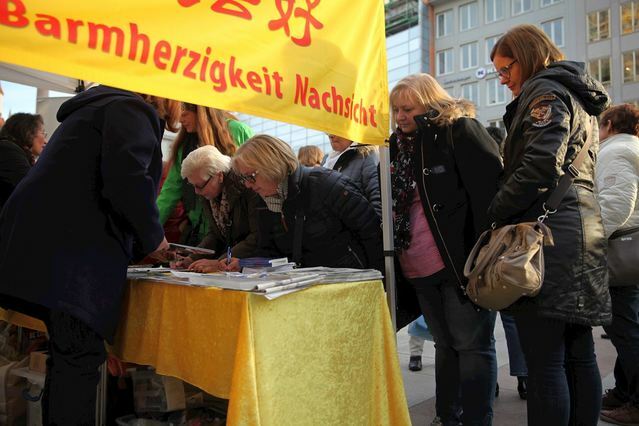 On Friday, practitioners set up two booths at Marienplatz, where they demonstrated the Falun Gong exercises, passed out flyers and collected signatures against the forced organ harvesting crimes. 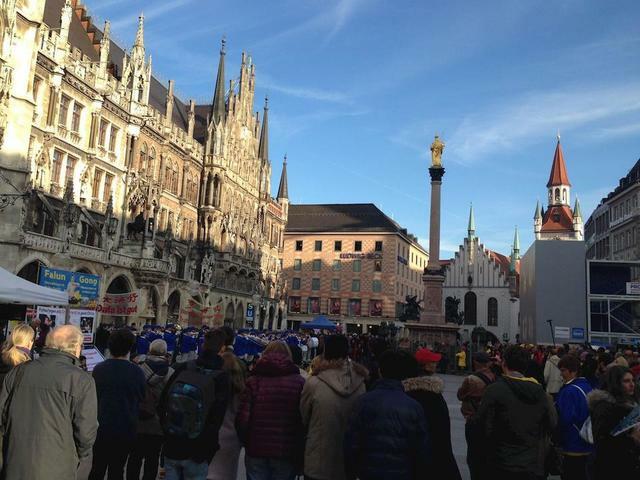 From 10 a.m. to 8 p.m., practitioners from a number of European countries scattered around the plaza, talking to tourists in dozens of languages about the persecution. Many people signed the petition without hesitation when they learned about the forced organ harvesting. 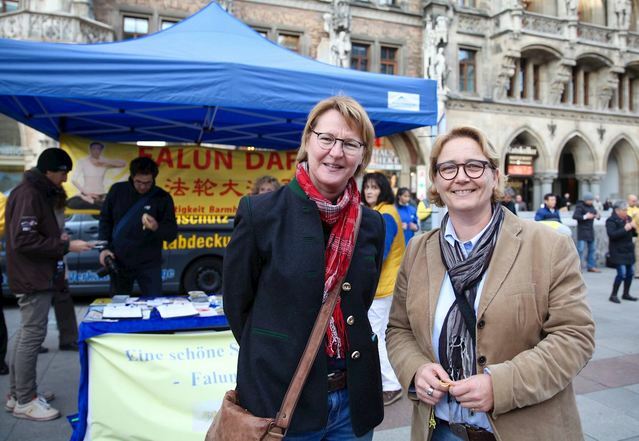 Susanna Sonnleiter, a nurse from Allgäu, and her friend Sabine Palme had seen the documentary about organ harvesting in China on 3Sat TV. “This is related to the dignity of humanity. Everybody is equal, and everybody should have freedom of belief, no matter where they are,” added Susanna.